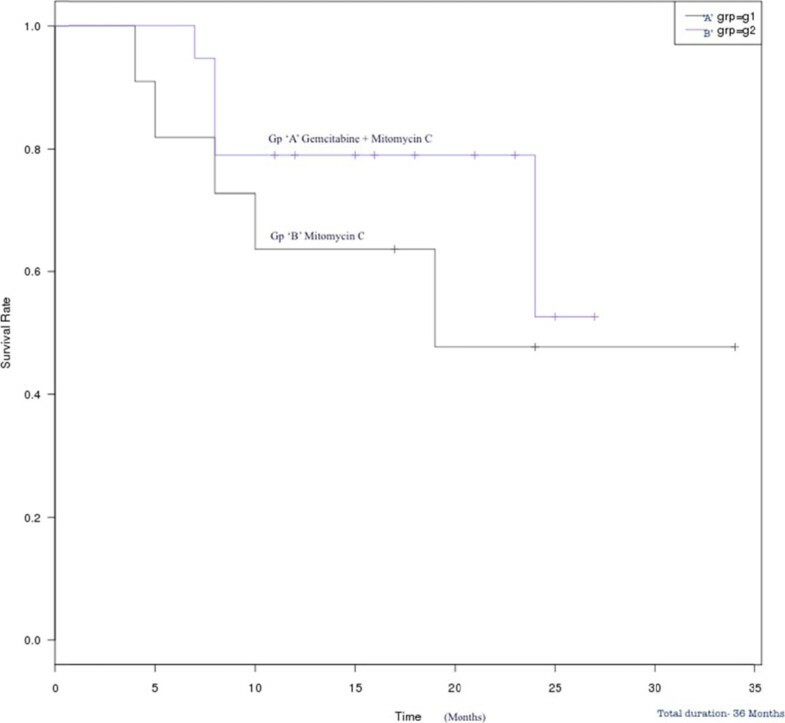 This study was conducted to investigate the ablative efficacy and safety of sequential intravesical gemcitabine and mitomycin C with mitomycin C alone in refractory non-muscle invasive bladder cancer (NMIBC). A total of 219 patients with refractory NMIBC were prospectively enrolled at tertiary academic center over period of Feb 2009-Jan 2012 & followed for next 3 yrs. They were randomly assigned to either of treatment arms: Gentamycin & mitomycin C (group A) or mitomycin C (group B). All patients underwent a 6-week induction regimen followed by a monthly maintenance regimen for one year if they responded to the induction course. In Group A 98 of 102 & in group B 94 of 96 patients completed the therapy and were evaluated for response while 6 patient left the therapy in between. The therapy was well tolerated in the rest of patients. In group‘A’ i.e Gentamycin & mitomycin C a total, 82 patients (83.67%) exhibited a complete response to intravesical therapy. In 12.2% (12) patients had biopsy proven recurrence (22±6.16 months). 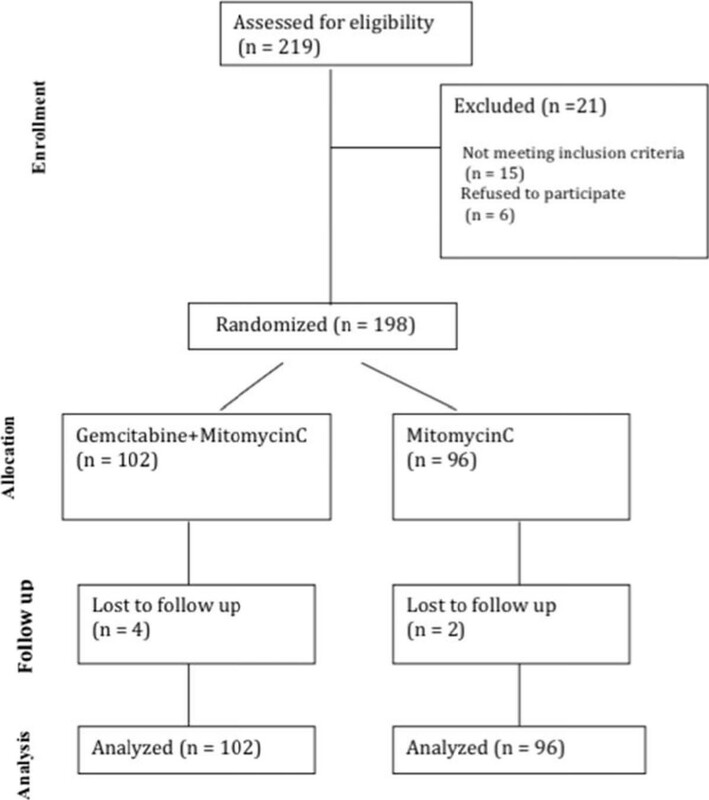 In group ‘B’ (mitomycin C), 63 (65.60%) patients exhibited a complete response to intravesical therapy, 22 patients (22.9%) showed a partial response. During follow-up, 16 patients (25.3%) developed recurrence within this period. (14.5 +/- 8.26 months). Chemoresection with sequential intravesical gemcitabine and mitomycin C administration may be a viable option for BCG refractory non-muscle invasive bladder cancer (NMIBC). Detail parameters of both groups. +Statistical significance was analyzed by the chi-square test. Details of adverse effects of therapy in both groups. CONSORT diagram showing the participants through each stage of a randomized trial.